Novelist Nickolas Butler isn’t afraid to tackle big ideas in his writing. Set in a rural Wisconsin town, his first novel, Shotgun Lovesongs, is an exploration of friendship and the ties that bind us to home. 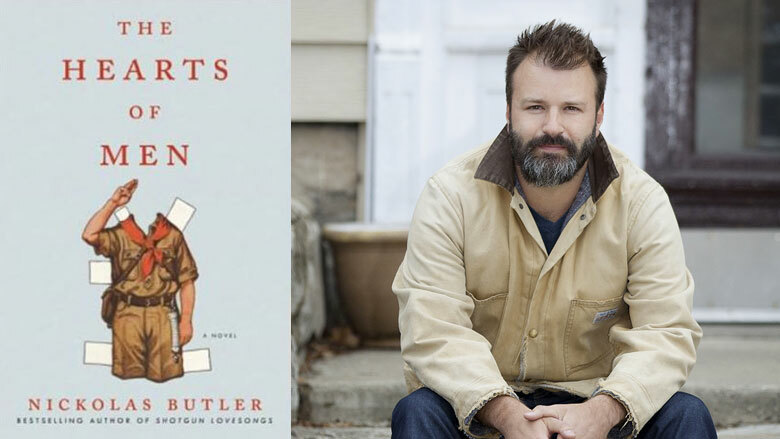 Butler’s sophomore effort, set in and around the fictional Camp Chippewa in Northern Wisconsin, seeks to understand the weighty subject of its title: The Hearts of Men. Told in four parts, spanning 1962 to 2019, The Hearts of Men follows two families through three generations. The camp in all its smoky, woodsy glory serves as the crucible through which they all must pass as they struggle to understand their relationships with one another and seek to find meaning in the wake of war and tragedy. It’s summer of 1962 and the high-achieving but socially awkward Nelson Doughty, antique bugle in hand, prepares for the morning reveille at Camp Chippewa. Scenes from his life unspool as if from an 8mm projector, revealing a young man desperate for not only approval but also guidance. The struggling Nelson finds a kindred spirit in Scoutmaster Wilbur, the old-school-take-no-guff leader of Camp Chippewa who becomes foundational in the formation of the Nelson we return to later in the book. At Camp Chippewa we’re also introduced to athletic, charismatic Jonathan Quick, a boy who seems to have it all. Where Nelson is frail, the object of taunts and violence because of his perceived weakness—I have to be smarter than them. I can’t fight them all at once, he thinks at one point—Jonathan reveals himself to be weak in another way. In a scene reminiscent of William Golding’s Lord of the Flies, Nelson emerges from a perilous predicament with a new understanding of both his own character and Jonathan’s as well. And this is really what the book is about. While The Hearts of Men might not be a study of manhood on the scale of Robert Bly’s prescriptive Iron John or Hemingway’s powerful yet conflicted The Sun Also Rises, it is a deep dive into the subject of what makes a man, flaws and all. Butler uses Nelson, Quick, and their families to challenge our assumptions about character, forcing the reader to consider what it actually is and, perhaps, how to know if we have it. As the generations move forward we meet an adult Rachel, who went on to marry Trevor, and their teenage son Thomas back at Camp Chippewa where an elderly Nelson is now Scoutmaster Doughty. It’s 2019, and what it means to spend a week in the woods in search of character is called into question in the age of Google and digital devices (not to mention that earning merit badges for tying knots is, like, so uncool). But, when a moment arises for Thomas to make a fateful decision, he finds strength in the “uncool” lessons of his father and Nelson for a scene that brings the novel to a chilling yet hopeful conclusion. Butler, a former Eagle Scout who lives in rural Fall Creek just outside of Eau Claire, has an excellent feel for the rhythms of camp life and a knack for understanding Northern Wisconsin. Here, as in Shotgun Lovesongs, Butler’s female characters seem overly defined by their interactions with males. But his deftly-drawn Rachel shows a deep consideration of the role mothers have in helping their boys become, as Nelson would say, the men they want to be. In all, The Hearts of Men is a worthy read and fine examination of the ways in which good character is—or isn’t—learned and passed along between generations, families, friends.